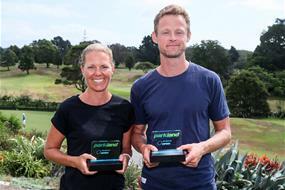 After a stunning weekend at the Whitford Park Golf Club, Liz McKinnon and Josh Longney have won the Parkland NZ Speedgolf Open titles. With an opening round of 79 in 47 minutes, followed by a clinical 75 in 45 minutes, Longney finished ahead of New Zealand amateur golfer Luke Brown who took out second place followed by Mark Le Compte in third. Both Saturday and Sunday provided extremely hot conditions, making the running aspect more challenging with temperatures reaching 30 degrees on a regular basis which meant the Whitford Park swimming pool was in full swing as well. After finishing in second place last year, Longney is thrilled to be on top in 2019. “It was an awesome weekend and nice to get on top of the podium this time round,” said Longney. Phil Aickin ended up claiming the best gross score with two rounds of 75 on his home track. McKinnon showed why she has never been beaten at this event with matching rounds of 80 in 57 and 58 minutes. In second place was amateur golfer Lily Griffin who made her debut in the weekend, showing she is one to watch for the future. Colette Blacklock ended the weekend in third place while Renee Fowler, Jan Rowsell and Fiona Keegan all impressed. McKinnon showed the perfect combination of the speedgolf elements, as she locked away another trophy. She interestingly wasn’t the quickest or didn’t have the best score in each round, but her consistency and experience all came together perfectly. One of the most impressive performances was returned on Sunday when Troy Harold flew around the course in 46 minutes scoring a remarkable 75, for a speedgolf total of 121. One of the successes of the weekend was the introduction of a nine-hole ‘Give it a Go’ opportunity, where players enjoyed a more casual format of speedgolf. Seven teams also competed in a relay competition (one hole each) with four experienced speedgolfers from Australia proving to be too good. There was a great international representation with players from all over the world playing this fun format over the two days. Countries included the United States, Australia and France. New Zealand Golf are dedicated to creating more opportunities for those that play golf and like to keep fit and will work to secure a venue for 2020.